Rarely have I encountered a book so beautifully written and so crushingly, devastatingly sad. The slave trade at this point in my readings just seems brutally unstoppable, a cancer metastasizing across the entirety of the continent, fueled by King Cotton and enabled by true believers and cynical exploiters of human capital. I was less interested in Baptist’s central argument, that America’s economic supremacy was only possible because of slavery (I’ll leave that for others far more educated than myself to debate) and was more interested in doing a deep-dive on the system of slavery itself, especially in the American South. After having read the slave narratives, I wanted as close to a definitive account of slavery in the United States that I could find in a single volume. I’ll be reading other books on the Underground Railroad and Reconstruction, as well as additional books on the African American experience in America, but this was meant to be the one that I would read on the heyday of slavery in the South. I feel like the book delivered. Baptist does a masterful job of weaving personal stories, first-hand accounts, plantation records and newspaper clippings along with the requisite facts and particulars that one would expect from an academic accounting of the period. His technique serves to engage the reader on a visceral level, making the human tragedy of the slave trade feel almost physical. Baptist’s accounting of the coffles that were force-marched from Virginia to Georgia were particularly compelling, as were his descriptions of the slave auctions at Mospero’s coffee shop in New Orleans. Baptist has a knack for assembling his vast research into cogent narratives peppered with just enough descriptive detail to really put the reader right into the room or the field or the auction house where these atrocities occurred. He uses narrative techniques brilliantly to constantly push and pull his story from a birds-eye view down to the fertile soil of the Antebellum South. But the North comes in for plenty of blame as well. Baptist shows time and again how New England merchants and those in the free states reaped the rewards of the economic efficiencies brought about by chattel slavery in the cotton fields of the American South. Even England, though they claimed the moral high-ground in their own abolishment of slavery, benefitted immensely as their textile mills and manufacturing plants profited from low-cost cotton from across the Atlantic. 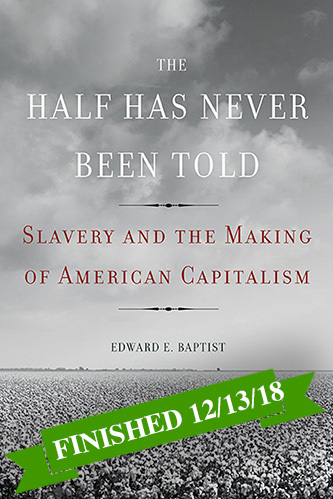 Despite all of the hardship depicted throughout, and Baptist’s desire to make his case about slavery’s role in America’s capitalist supremacy, he retains a disciplined, almost matter-of-fact tone over nearly six hundred pages. I never felt like he was manipulative in his descriptions of events or cloying in his storytelling. All in all, this was a haunting read and an exceptional telling of a terrible tale.